To start in Windows 10 the Administrative Tools, the solution is simple via new Windows fast access Menu, the solution is also for Windows 8.1 and 8! In Windows 10 Administration, you will find all the necessary Windows management tools to configure and optimize the system to achieve optimal performance on the system, as well as monitoring functions to help you to identify potential weaknesses and problems faster Recognize. The sample is also suitable for Windows Server systems 2016/2012. 1.) ... Quickly open administrative management tools! 2.) ... Create a desktop shortcut for / to the admin tools! 3.) ... What to note if something is missing in the administration! See also; ► change administrator in windows 10! 1.) Quickly open administrative management tools! It is very simple and easy on new windows, to open the admin tools and change some one of the useful settings on the private or the computer in the office in you company, if your administrator have to many to do. 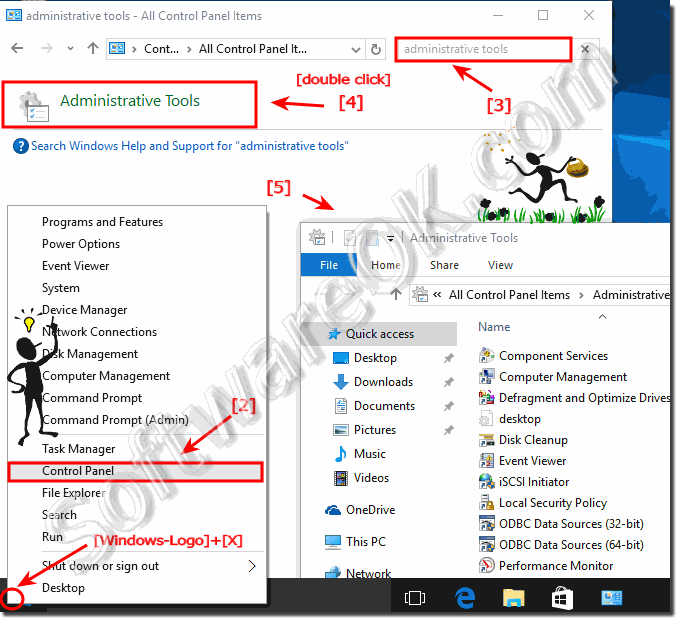 (Image-1) Administrative Tools Folder Windows-10! Administrative Tools is a folder in Windows-10 Control Panel that contains tools for system administrators and advanced users. The tools in the folder might very depending on which version of Windows you are using. 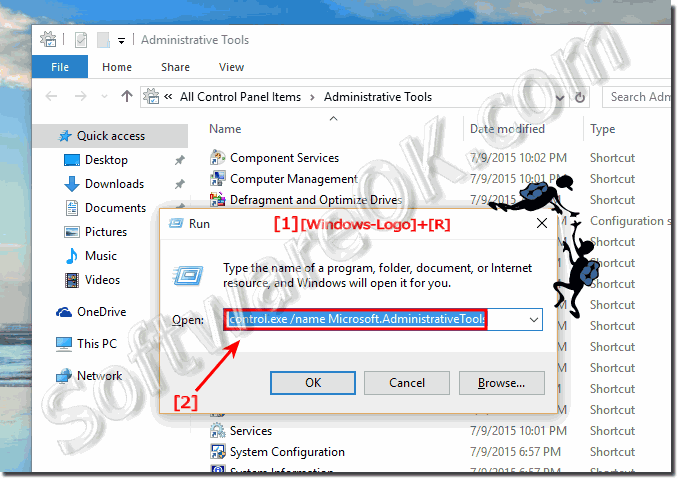 (Image-2) RUN Administrative Tools, in Windows-10! 2.) Create a desktop shortcut to the admin tools! After you have found and opened the administrative tools, it is easy to drag and drop a shortcut to create it. And just drag and drop (right mouse button) to the desktop and just put the folder itself, or the individual tools needed! 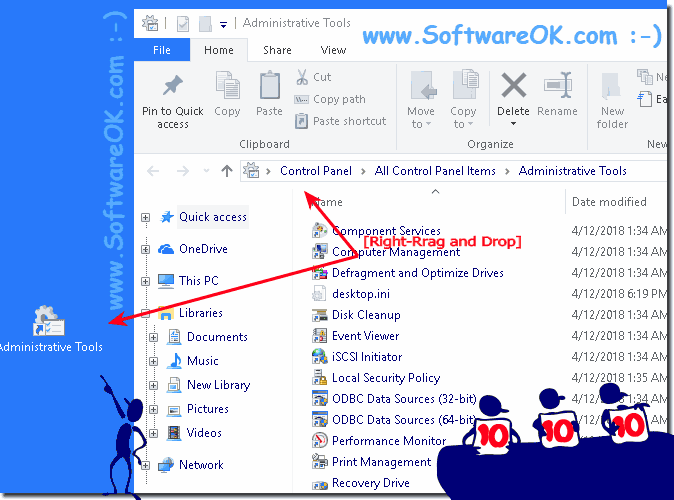 (Image-3) Administrative Tools on Windows Desktop! 3.) What to note if something is missing in the administration! Depending on Windows 10 version home/PRO/Enterprise Server 2016/2012 there are deviations in the administrative tools, not every version has the same functions, some are replaced by apps at AutoUpdate and are then different way accessible, or runnable. See also: ► ► ► The other Windows-10 functions, how to activate them? It is easy to see that Windows 10 does not lag behind Windows Server Systems 2016 and 2012 in terms of administration, despite a strong orientation to the apps! But you can quickly turn it into a server computer mode that can do a lot of tasks, such as a Web Server , FTP server, etc... Find all the necessary in more Windows 10 advanced features!